Tooth loss is a difficult and often painful experience, but the Goodman Family Dentistry team in Columbian, TN ensures the tooth replacement process is quick, comfortable, and effective. We offer a number of restoration options to meet your unique needs, depending on the number and location of missing teeth. 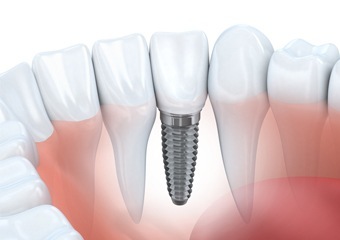 If you’ve lost two or more teeth in a row, we will likely recommend a dental implant bridge. These restoration options are crafted using two dental implants, one at each end of the restoration, to support the row of replacement teeth. When you’re ready to get started rebuilding your smile, call our Columbia, TN dental office to schedule a tooth replacement consultation appointment with our skilled dentist and dentistry team. We will review your oral health and help you to find the best tooth replacement solution to meet your needs. The traditional fixed bridge was crafted using dental crowns fused to both sides of a replacement tooth or teeth. 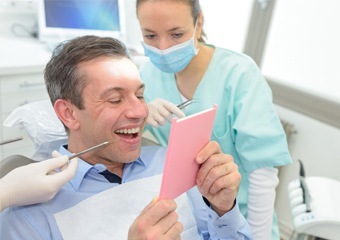 The crowns are then affixed to healthy teeth on either side of the gap in a patient’s smile. 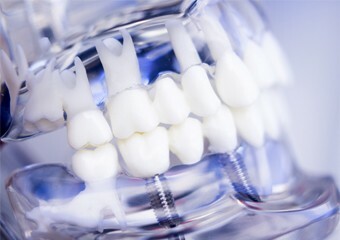 Implant supported fixed bridges are used when two or more consecutive teeth are lost. Like a traditional bridge, the implant retained fixed bridge will be crafted using dental crowns attached to implant posts rather than healthy teeth to provide support for the dental restoration. Traditional tooth replacement options like fixed bridges and dentures are supported by healthy teeth and oral structures. This can cause more damage to remaining teeth and overall oral health. Instead, a dental implant supported restoration is a fully self-supporting solution. The dental implant posts mimic healthy tooth roots, providing support for the restoration and protecting healthy oral structures. Implant retained restorations deliver the closest to natural results, giving patients back their healthy, functional smiles. The dental implant post replaces the stimulus from the smile’s lost tooth roots. This ensures the maintenance of healthy jawbone density and gum tissue volume and the patient’s optimal level of oral health. Fully self-supporting, your implant retained fixed bridge will not place pressure on surrounding teeth and oral structures, making them a more conservative restoration option compared with traditional fixed bridges. After placement, an implant supported fixed bridge will remain functional for three or more decades in many cases, allowing you to speak and smile with confidence and consume all of your favorite foods. You can easily brush your implant retained fixed bridge just like healthy, natural teeth. There’s no need to worry about changing your oral hygiene routine to accommodate your replacement teeth.